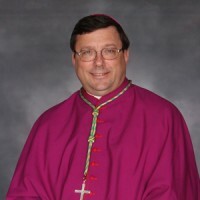 Bishop Lee Anthony Piché was born in Minneapolis in 1958. He is the son of LeRoy and Cecilia Piché of New Brighton, Minnesota and the oldest in a family of seven children. He has four brothers and two sisters and is uncle to sixteen nephews and five nieces. Bishop Piché was ordained to the priesthood on May 26, 1984 at the Cathedral of Saint Paul, following his theological studies at the Saint Paul Seminary. He holds a Master of Arts degree from the Seminary and Master of Philosophy degree from Columbia University in New York. He served as associate pastor of the Church of Saint Mark in St. Paul until 1987 and taught undergraduate philosophy at the University of Saint Thomas from 1994 to 1997. He returned to full time parish ministry in 1997, serving for nearly six years as Pastor of the Church of Saint Joseph in West St. Paul and then until 2008 as pastor of the Church of All Saints in Lakeville. From 2000 to 2008, Bishop Piché also served as Chair of the Commission for Ecumenism and Interreligious Affairs for the Archdiocese. Archbishop John C. Nienstedt appointed him Moderator of the Curia and Vicar General in 2008. At the same time, he was appointed pastor of the Church of Saint Andrew, located near Como Lake in Saint Paul. The Vatican announced his appointment as Auxiliary Bishop of the Archdiocese of Saint Paul and Minneapolis on May 27, 2009. He was ordained as bishop on June 29, 2009 by Archbishop John C. Nienstedt at the Cathedral of Saint Paul. He served as auxiliary bishop until June 15, 2015.